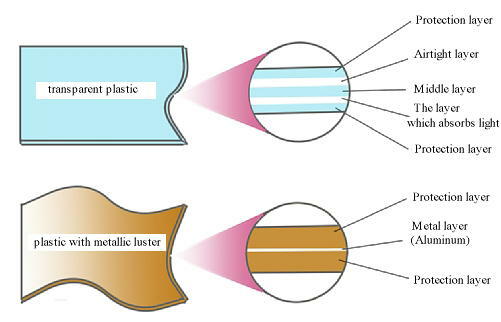 Mr.Usukawa,is it really that there are many kinds of plastics? That's right.The plastic is still continuing the evolve. Yes. From what is it most important to protect food, when packing food by a plastic? Well -- Are they neither a mould nor a bacteria? Well, is keeping food from molding most important? Of course, you have to protect food from microbials, such as a mould and a bacteria. But in fact, it is not only they to degrade food. Do you think what? Correct answers are an oxygen and a glow. Does a plastic let gas pass? That's right. As well as a glow, a plastic also lets gass pass as I am unexpected. Well, I didn't think that a plastics let gass pass. For example, the floating balloon will stop floating in one day. This is because the light gas in a balloon comes outside little by little through the film of rubber. When packing food, even if it seals by a plastic, oxygen goes into inside. Really? The microbe cannot pass through a plastic. But, food will decay with oxygen and light. That's right. So, in progress of the packing technology of a plastic, it is important how we intercept oxygen and light. Mr.Usukawa, is there any plastic which cannot let oxygen pass easily? Yes. In plastics, polyvinyl alcohol(PVAL) cannot let oxygen pass easily. The degree through which oxygen passes changes with plastics, doesn't it? That's right. But the film made from this PVAL will be weak, and will be torn immediately. Then, we cannot use for packing. That's right. Then, we use the technique of a multilayer film. It is a three-layer film which sandwiched PVAL from both sides by the strong plastic. It prevent oxygen passing through it by PVAL, and an outside film maintains strength. It is great! Then, when making it not let a glow pass, do we use a stratum similarly? That's right! If the layer which prevents glow through is piled up, we can perform packing which intercepted not only oxygen but light. Mr.Usukawa, there are many places where the plastic other than packing of food is playing an active part. That's right. The plastic used for the prosthetic device which acts instead of the body is also continuing evolution. Is it an artificial leg and an artificial arm? Yes. Since a plastics is an abiololgical ingredient, the pollution by the bacteria or a virus is made as for it to a minimum. Therefore, the plastics is suitable as a medical-use ingredient. Although the plastic which was excellent in processability by the artificial leg or the artificial arm is used widely, there are some which used the characteristic of the plastic efficiently in others. Is it a prosthetic device made just because it is a plastic? Is it using softness efficiently? That's right.It is an artificial heart, an artificial blood vessel, etc. as which softness and an advanced function are required. Can they harness the merit of only a plastics? That's right.Many researches are done in order to solve the problem of how to fit a plastic material to an organization. The plastic is playing an active part in various places, using the characteristic efficiently.